I have to admit I am pretty pleased with myself for coming up with this easy and super-cheap way to create wall decals for my daughters' bedroom! 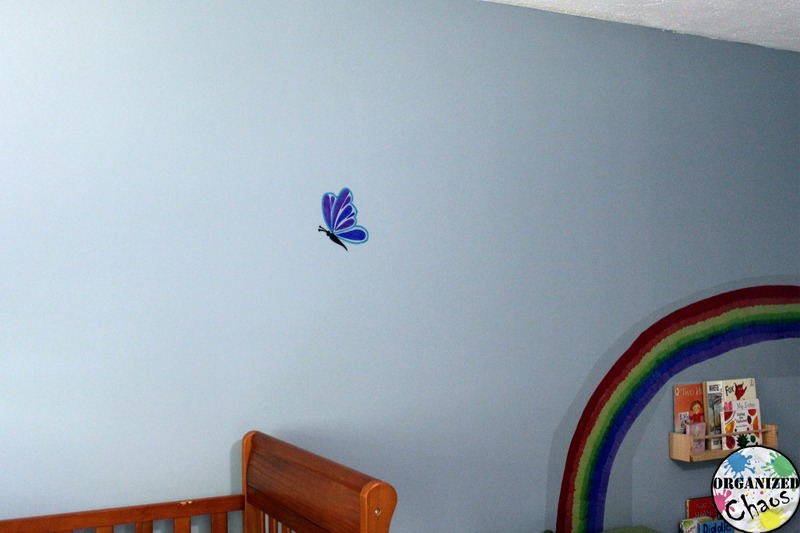 Wall decals are so much more expensive than I ever expected them to be, and with lots of wall space to fill, I needed a cheaper solution. 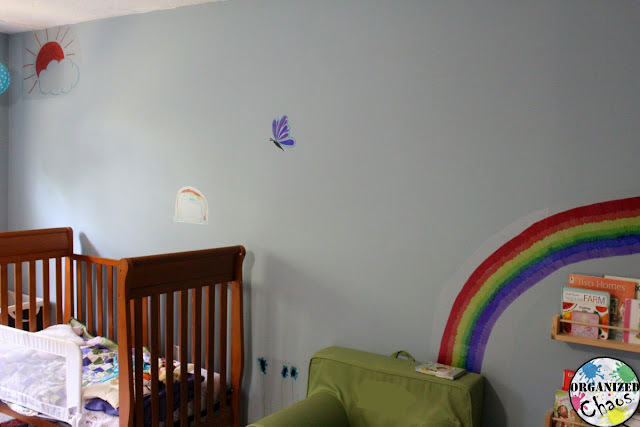 With this DIY, not only did I get a cheap alternative, but I actually like the results even more than store-bought decals because the girls and I made them together. Every time I see them I can't help grinning! I hope you will be inspired to try this with your own children. Then, after months of trying to find cheap but long-lasting (and attractive) decals to decorate the walls in my daughters' bedroom, I finally had the idea to use that contact paper to make my own! The main trick was figuring out what to use to draw my designs. I thought about printing out pictures on regular paper and then putting the contact over the top to attach it to the wall, but I wanted something that was semi-transparent like regular decals. The only thing I found that would stay on the slick surface of the contact paper was permanent (oil-based) markers. 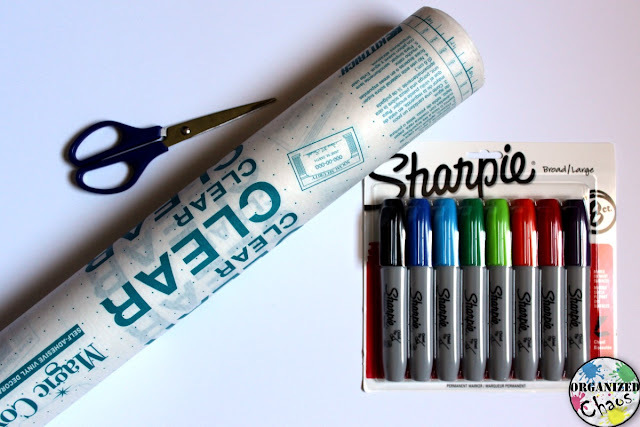 Although I could have used the many permanent markers I already had, I really wanted to be able to make some larger decals and I didn't want to spend my entire summer drawing it with the finer tipped markers that I had, so I ended up buying this set of larger Sharpies. You can certainly use the regular markers if you don't need to cover a large area (or have a lot more patience than I do)! 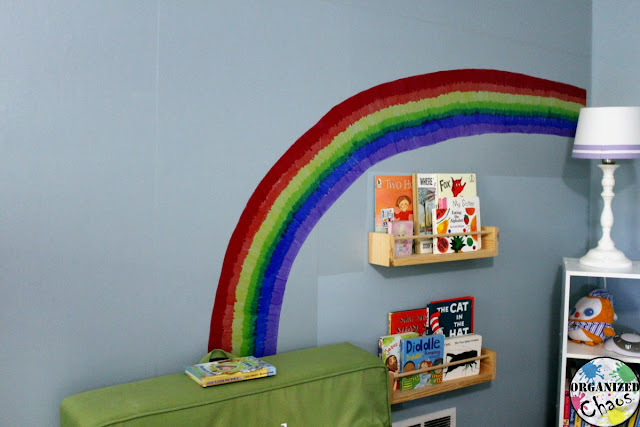 The main thing I knew I wanted to add to the walls was a rainbow, and that was by far the most challenging part of the project. 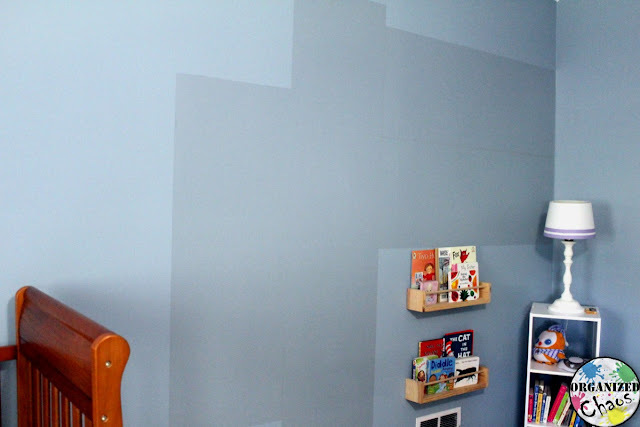 Besides the fact that it required quite a bit of scribbling, getting large sheets of contact paper onto the wall without smudging it too much or wrinkling was no easy task. If you can get someone to help you, it would definitely be easier with two people. 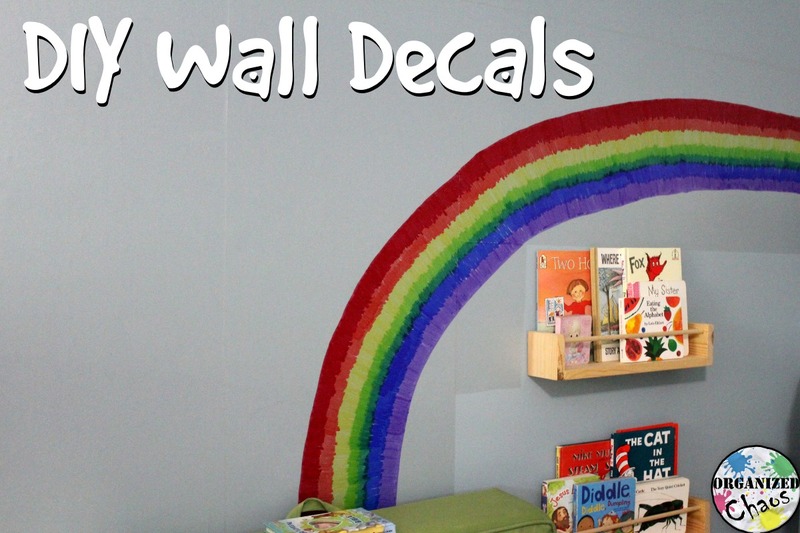 Having to draw with the contact paper already on the wall was another added challenge- as all teachers will know, writing or drawing on a vertical surface is very different than a horizontal one! The other decals were much simpler because I could draw them at a desk with the backing paper still on, cut out the shape, and put it up easily. I made two butterflies and a sun, and the girls loved them all! When I asked them if they wanted to add some of their own drawings, they were thrilled! Both of them decided to add some flowers (and one decided she wanted an extra, smaller rainbow right next to her bed as well). 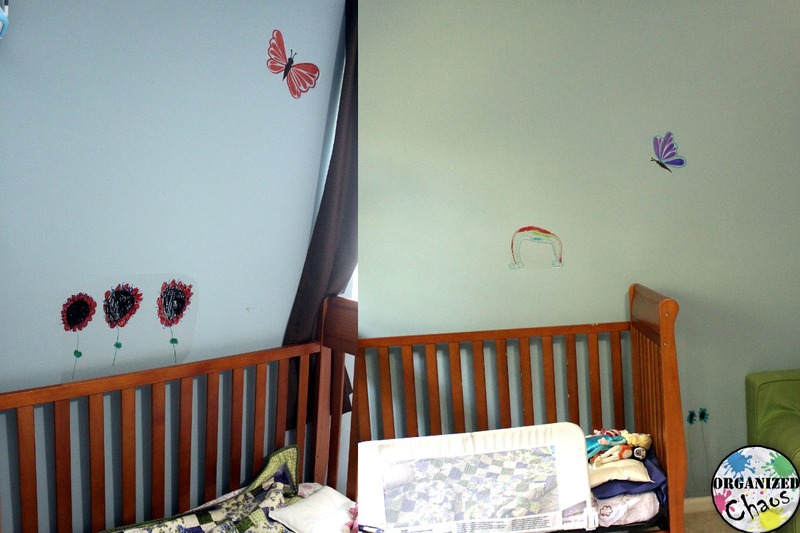 This is the best part for me- having their drawings as part of their room decor is just so precious! And seriously, I couldn't have made better flowers if I had tried. Want more? Subscribe here to the Organized Chaos newsletter and get more music teacher ideas and resources for home and school sent straight to your inbox!